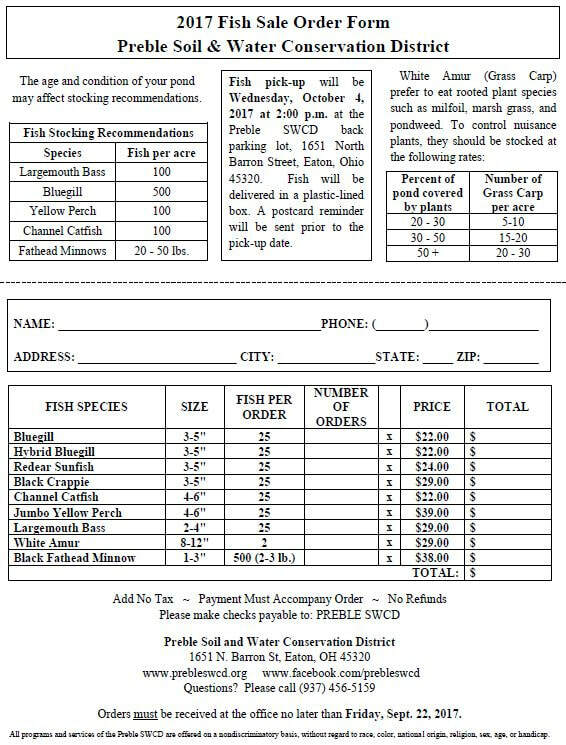 The Preble Soil and Water Conservation District is accepting orders now through September 22rd for our annual fish sale. Fingerling-sized Largemouth Bass, Redear Sunfish, Black Crappie, Channel Catfish, Bluegill, Hybrid Bluegill, and Yellow Perch may be purchased for pond stocking. Black Fathead Minnows and White Amur will also be offered for sale. Most ponds are stocked with a combination of a predator species and a forage species. Largemouth Bass is the recommended predator species for ponds in Ohio. Because bass feed almost entirely on other smaller fish, a forage species should be stocked as a food source. Bluegill is the most commonly stocked forage species. Redear Sunfish, also known as Redear Shellcracker, is also a good food source for bass. Their tendency to feed on snails, crayfish, and other mollusks earned them the name Shellcracker. Channel Catfish can be stocked but probably won’t reproduce in most recreational ponds. If they are fished out, restocking is the best way to keep a desired population. In larger ponds, structures can be installed to encourage spawning. Yellow Perch and Black Crappie should only be stocked in larger ponds. They can compete with other species for food and eventually take over. Stocking ponds with fish caught from streams and lakes is discouraged. It is easy for even the experts to misidentify some species. This practice usually results in an undesirable population in the pond. White Amur, often called grass carp, are sometimes stocked as a biological method for controlling weeds. Even though they are a member of the minnow family, they have the potential to become quite large. As they grow, they develop a ferocious appetite for certain types of submerged aquatic vegetation, which is why they are effective in ponds. However, they are not effective for controlling algae and generally work best along with other means of weed control. When stocking a pond, remember, the number and type of fish stocked will affect your success. Maintaining the proper balance of species is the key. The Preble Soil and Water Conservation District can assist you with questions on stocking a pond. For more information, call the office at (937) 456-5159, or visit their website at www.prebleswcd.org to download an order form.